← Small Steps Blog Tour! Small Steps Back in Print! 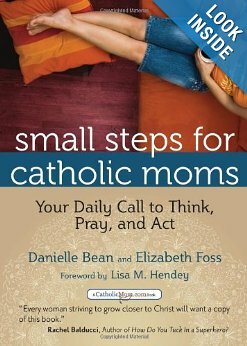 Small Steps for Catholic Moms: Your Daily Call to Think, Pray, and Act. Since its original publication years ago, moms of all ages and stages of life have told me how much they have enjoyed and *needed* this book as a support in their daily prayer lives. That makes my co-author Elizabeth Foss and me very happy because that is exactly why we wrote it. We know that a mother’s days are unpredictable and time for sit-down prayer can be sporadic, but we also know that every mother needs a daily connection and a real relationship with her Creator. We were made for Him, and we will be restless until we rest in Him. Big changes happen with small steps. This book is designed to be imminently do-able, even for moms in their very busiest seasons of life. Just “think” “pray” and “act,” in one page a day, and you will find yourself growing stronger in virtue and closer to Our Lord. This popular book has been out of print for over a year now, and copies have been hard to find. Don’t miss out on this opportunity to pre-order your new copy today! 3 comments to Small Steps Back in Print! I’d love a button. Choose the size you like best to suit my page. Let me know if I don’t have a spot for it to be posetd. I’m still becoming blogger friendly. This is all new to me. Tell me more about those boots!